In the 1990s, when you wanted to rent movies, there was only one way to do it: head into a Blockbuster. At least that was the case until 1997 with the advent of Netflix. When the company first got its start, the world of on-demand streaming was nonexistent. Instead, Netflix.com was a DVD rental and sales site where you paid a low monthly fee for unlimited DVD rentals. By 2005, more than 4.2 million people became members of Netflix and Blockbuster began to fade. Everything changed again in 2007 when Netflix introduced streaming, where members could instantly watch TV shows and movies online. All you needed was your parent’s password, and the rest is history. Now, Netflix is a video streaming giant with 139 million paid memberships in over 190 countries. Members can watch as much as they want, anytime and anywhere, including original series, such as the highly successful Orange Is the New Black and House of Cards. With all this going for it, it should be no surprise that Netflix is a sought-after employer for MBAs with a keen interest in disruptive tech and entertainment. Netflix is famous for its unique company culture. According to Business Insider, the company “does not tolerate either failing employees or ‘brilliant jerks.’” That can be both good and bad depending on your viewpoint. What it does translate into is a company that focuses on “freedom and responsibility,” meaning you’ll be expected to work hard, hit the ground running, and excel in a cutthroat environment. 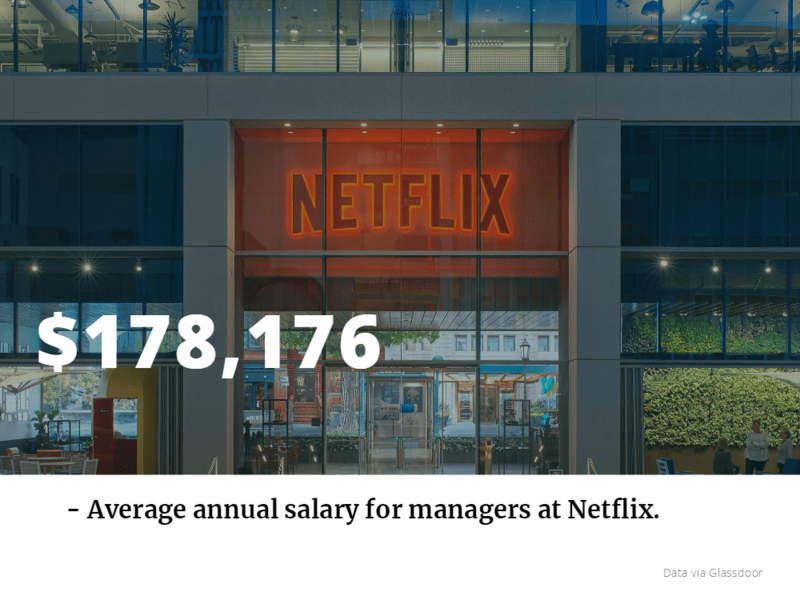 The good news is that this equates to impressive pay with 800 employees on Glassdoor giving the company 4.2 stars for “Compensation & Benefits.” On average, a manager at Netflix can expect to earn $178,176, while a senior manager makes $213,243. The key is that you perform and perform well at Netflix. There’s no handholding. Instead, you can expect long hours and a tough work/life balance rating at 3.3 according to Glassdoor. And there’s no doubt that hard work has paid off for the company. Since 2012, the Netflix stock has increased 2,500 percent and is the indisputable leader in the entertainment industry. It might be a fairly ruthless culture, but it’s working and producing results. According to one former employee who posted an Indeed review in March 2019, “the benefits and the company itself were great: flexibility, values, inexpensive insurance, no dress code, etc.” And others agree. When you work at Netflix you can expect half free lunches, an amazing kitchen with all kinds of snack and drinks, and fair PTO and sick days. However, you can also expect a demanding schedule that requires you to be on your game and getting the job done. Don’t expect getting a job at Netflix to be a piece of cake. According to a 2016 Reddit AMA (Ask Me Anything) hosted by a purported Netflix employee, the interview process is long, involved, and designed to make sure your personality fits the company culture, and you’re technically capable. According to the Reddit, you’ll talk to “eight or so people,” some of whom are from HR while others are from higher up in the department where you’re applying to. Typically, if even a single person doesn’t like you, you won’t get the job. You’ll even be flown out to headquarters for an all-day interview just to make sure you’re the right person for the job. For more insight, there’s a great Netflix podcast that is all about how the company hires, which you can watch here. Generally, Netflix does not high new grads or interns. According to a thread on Quora, Netflix does not consider itself an entry-level company. If you’re an exceptionally skilled candidate or someone with a rare skill, the company may make an exception, but for the most part, the company is looking for employees that already have experience.